The U.S. apartment market is hotter, more competitive and more popular than ever. With increasing interest in sustainable living, the newest and trendiest urban apartment buildings are also green. 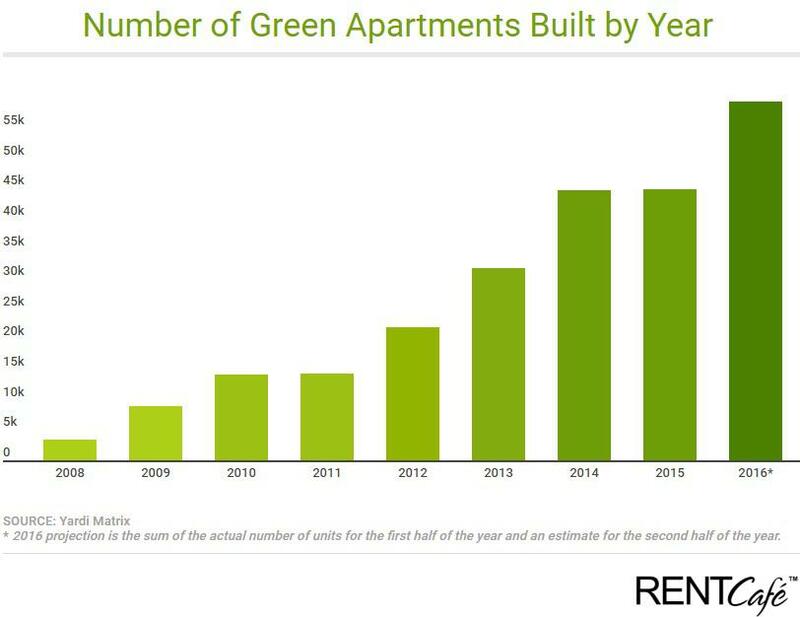 RENTCafé shows that there are now 13 times more LEED-certified apartments being built per year than 8 years ago, when LEED-certification began being widely-used by the multifamily sector. Leadership in Energy and Environmental Design (LEED) is an international recognised green building certification system developed by the U.S. Green Building Council (USGBC). As of October of this year, there are 3,187 LEED-certified (or pending certification) residential projects in the United States, according to the U.S. Green Building Council. To show how much the U.S. apartment market has evolved in terms of sustainable building, on average 18% of the large apartment buildings (of 50+ units) that hit the market last year in the U.S. were LEED-certified or proposed for certification. In 2008, only 2% of large-scale apartment properties were green. Overall, about 15% of the U.S. apartment stock (in the large multi-family segment) built after 2008 is built by sustainable standards. By year end, a total of 59,000 LEED-certified apartments are expected to be completed in 50+ unit buildings, 4 times as many as 5 years ago. The volume of green apartment construction is concentrated in urban areas, according to property data from Yardi Matrix, which covers rental buildings with 50 units or more. 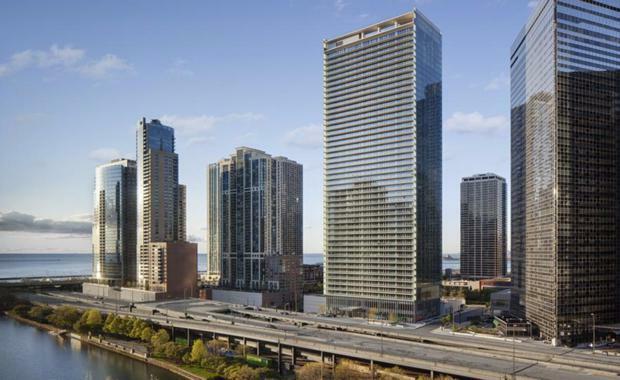 Chicago leads the country with the largest number of green-certified apartments, approx. 13,800. 34% of Chicago’s newer apartment buildings (opened since 2009) are green. Seattle, WA comes in second with 11,200 green apartment units. About 27% of Seattle’s post-2009 apartments in large-scale buildings are sustainable. With an inventory of 8,000 green apartments on the market as of this year, Portland comes in third, but the Rose City gets extra points for sustainable efforts – a whopping 45% of Portland’s apartments built after 2009 are green. Some cities stand out for being the greenest cities for renters, as they offer the largest numbers of eco-friendly apartments relative to their total population. 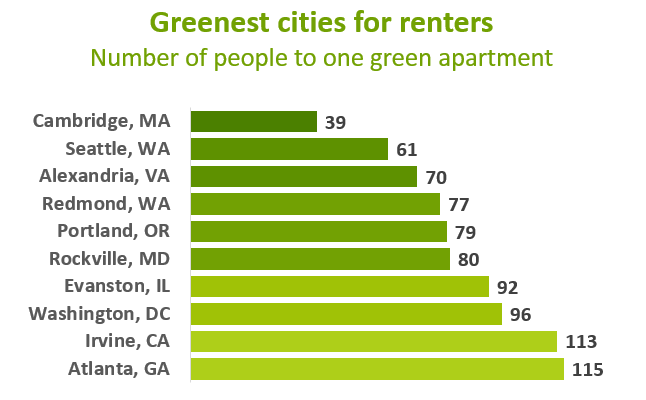 Cambridge, MA tops the list of the best cities for “go green” renters with 1 green-certified apartment for every 39 people, followed by Seattle, WA 1:61 and Alexandria, VA 1:70. Other examples worth mentioning are Redmond, WA, Rockville, MD, Evanston, IL, Washington, DC, Irvine, CA and Atlanta, GA, which also make the top 10 list of cities with most green apartments for number of residents. Although eco-friendly construction is becoming more common, green-certified apartments overall continue to be more expensive than apartments that don’t follow sustainable standards. Rents in LEED-certified apartments exceed those in regular apartments by $560/month on average, nationwide. Looking at the price of rent in apartments built after 2009, the national average rent for a LEED-certified apartment is $2,260, while that for a regular apartment is $1,700. In other words, green living is 33% more expensive, and that remains true across all asset classes (high-end, mid-range or affordably-priced apartments). A recent RENTCafé survey of over 2,600 renters revealed that, while a large portion of renters care about the environment and would like to live in an environmentally-friendly building, when it comes to cost, they are not willing - or able - to pay nearly as much as the market currently asks. 52% of respondents said they would pay no more than $100/month in extra rent for the benefit of living in a green apartment, while 23.5% said they wouldn’t pay anything extra. At the opposite end, 10% of respondents are willing to pay upwards of $500 per month to rent a green apartment. The largest share of those willing to spend that much are baby-boomers. A further analysis of Yardi Matrix rent data showed that average rents for LEED-certified apartments can range widely depending on location. 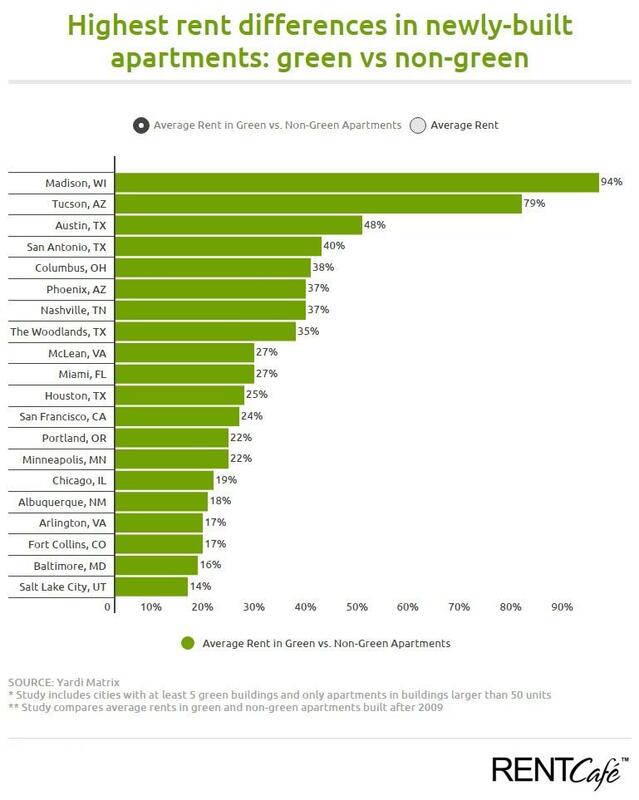 In university town Madison, WI green apartments rent for almost twice as much as regular new apartments, (on average $3,000 vs $1,550). In Tucson, AZ eco-conscious renters have to pay 79% more if they want to live in a green building (on average $2,630 vs $1,460). In Austin, TX there is a 48% rent difference, and in San Antonio, TX a 40% difference in rent price. The bottom line is that the American apartment market is greener than it’s ever been, offering eco-minded renters scores of eco-friendly features and amenities, from energy-efficient appliances to electric car charging stations. With a growing number of people who want to live and work in buildings that use materials, finishes, and fixtures that have a good impact on the community and the environment, increasing demand for green-certified rentals is expected to continue. There is plenty of encouraging evidence that these are just the beginning stages of green living for the multi-family industry in the United States. However, for the time being and until prices level off, renting in a green- certified building remains out of reach for many Americans.